Few teams long for the good old days like the Buffalo Bills. For a franchise that played in four straight Super Bowls back 20 years ago, the last decade has been torture. After going 4-12 last year the first year under new Head Coach Chan Gailey, Buffalo has now gone through six straight losing seasons and still hasn't made the playoffs since 1999. This is tied with the Detroit Lions for the longest such drought in the league. Buffalo started 0-8 last year, but five of those losses came by one score or less; two in overtime at AFC playoff qualifiers and another by a field goal at NFC Championship Game host Chicago. The Bills then finished 4-4, and one of those losses came by a field goal at eventual AFC champion Pittsburgh. One problem they had, though, which extends to this season, was going just 1-5 in AFC East play. So, will the Bills be any better this year than last? Yes, they might; and yet it might not show up in the W/L columns. This offseason Buffalo lost LB Paul Posluszny and S Donte Whitner, dumped DE Marcus Stroud, and parted ways with a handful other defensive players. They also traded WR Lee Evans. On the plus side the Bills added WR/Wildcat QB Brad Smith and former Packers LB Nick Barnett, and they're hoping to benefit from a full season of a supposedly healthy LB Shawne Merriman. They also went defense with their first four picks in the draft, taking Alabama DT Marcell Dareus at No. 3 overall, Texas CB Aaron Williams at No. 34, Louisiana State LB Kelvin Sheppard at No. 68 and North Carolina S Da'Norris Searcy at No. 100. And all four of those have a chance to make an immediate impact. This unit ranked 25th overall last year at 305 YPG and 18th in rushing at 108 YPG and it got held to 14 points or less in exactly half their games. So there's definitely room for improvement. On the bright side RB Fred Jackson nearly ran for 1,000 yards despite being limited to fewer than 10 carries five times. 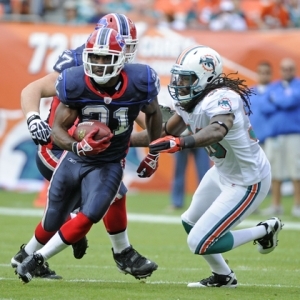 And the Bills are expecting a bigger contribution from second-year RB CJ Spiller. Also, say what you want about Ivy League quarterbacks, but Ryan Fitzgerald is becoming a legitimate NFL starter, The former Harvard signal-caller completed 58 percent of his throws last year for 3,000 yards and a 23/15 TD/INT ratio. On the down side the trade of Evans leaves Buffalo with Stevie Johnson and a bunch of unheralded youngsters at WR. And the biggest problem on this side of the ball is the line, which has seen some shuffling. When you're trying to get out of the division basement the last place you want to have problems is along the offensive line. Buffalo ranked 24th overall last year, allowing 362 YPG, and dead last vs. the run at 170 YPG. In fact, the Bills allowed opponents to rush for more than 200 yards in half their games last year, and allowed nine opponents to hit the 30-point mark. That's why they went big on defense in the draft, and why they're counting on Merriman to help provide a pass rush and Barnett to help stuff the run. But those are all pretty big “ifs.” Buffalo should be better on defense this year, if only because they were so bad last year. The Bills go up against a tough slate this season, as the AFC East takes on the NFC East in cross-conference play. Buffalo plays six games against teams that made the playoffs last year, including their two vs. both the Jets and Patriots, plus games at the Giants, Dallas, and San Diego, and home dates with Oakland and Tennessee. They also play three in a row on the road in November. Overall the Bills will play the second-toughest schedule in the league this season, based on last year's W/L records. Legends is offering odds of +2,000 on Buffalo to win the AFC East this season, +7,000 to win the AFC and +11,000 to win the Super Bowl, with a regular-seasons wins ‘over/under’ of 5.5. We get the feeling the Gailey has the Bills on the improve, but with the troubles along the O-line and on defense and a brutal schedule, we can't see Buffalo winning more than four or five games this season. So we'll play the “under” 5.5 for NFL season win total predictions.